For other uses, see Molossus. "Jennings Dog", Roman copy of a lost Greek bronze statue, on display in the British Museum. The Molossus (Greek: Μολοσσὸς) or Molossian hound is a breed of dog from ancient southern Europe. Kuchi dog, an ancient livestock guardian dog breed from Afghanistan. This ancient breed (from 7000 years ago) of dog is considered to be the ancestor (in rivalry with the Alaunt, the dog of the Alans) of today's Mastiff-type dogs and of many other modern breeds, and can weigh over 200 lbs). Mastiff-type dogs are often referred to as Molossus dogs or Molossers. It is one of the best-known breeds of antiquity; however, its function and physical characteristics are debated. This large ancient breed was, along with the Tibetan Mastiff, an important ancestor of modern breeds such as the modern Molossus in Greece, the English Mastiff, St. Bernard, Great Pyrenees, Greater Swiss Mountain Dog, Macedonian Šarplaninac, Kuchi dog and Bernese Mountain Dog and its most direct relative, the Molossus of Epirus. Dogs were used by the Epirotan tribes in war, and were undoubtedly used much earlier in history. The Roman Empire, starting with Marcus Aurelius, also used dogs in combat. The Romans trained the Molossian dog (or canis molossus) specifically for battle, often coating them in protective spiked metal collars and mail armor, arranging them into attack formations. Some scholars contend the Molossus was used by the Ancient Greeks for fighting. Described as having a wide, short muzzle and a heavy dewlap (similar to modern Mastiff breeds), the Molossus was used to fight tigers, lions, elephants, and men in battle. 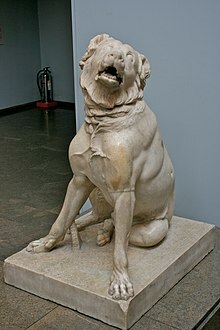 A Roman copy of a sculpture of a guard dog (known as the Jennings Dog) on display at the British Museum, is generally considered to represent a Molossus, which in turn is very similar to remaining breeds of livestock guardian dogs from Epirus, as well as from Europe and Central Asia. Most scholars agree the Molossus originated with the Molossis people in the mountainous regions of ancient Epirus (part of modern Albania and Greece). The Molossians were renowned for their vicious hounds, used by Molossian shepherds in the mountains of Epirus to guard their flocks. The poet Grattius, perhaps a contemporary of Ovid, writes "...when serious work has come, when bravery must be shown, and the impetuous War-god calls in the utmost hazard, then you could not but admire the renowned Molossians so much." The breed was native to ancient Epirus (present day Albania and Greece) and the Balkan region. It later spread to Italy, around the Mediterranean and across Europe. Virgil says the Ancient Greeks and Romans used the heavier Molossian dogs for hunting (canis venaticus), to guard the home, and watch over livestock (canis pastoralis). "Never, with them on guard," says Virgil, "need you fear for your stalls a midnight thief, or onslaught of wolves, or Iberian brigands at your back." Aristotle mentions them in The History of Animals, praising their bravery and physical superiority. The breed's name was used to name the bat Molossus and, in turn, the family Molossidae. Today the breed is making a comeback from nearly becoming extinct. Purebred breeding pups from Italy can cost $5000 each. ^ EasyPetMD. Molossus Breed Information. ^ The Dog People by Rover.com. Extinct dog breeds. ^ Dogue De Bordeaux: A Comprehensive Owner's Guide by Joseph Janish, ISBN 1-59378-215-2, 2003, Page 10,"... THE DOGUE DE BORDEAUX The Dogue de Bordeaux falls into a group of dogs classified as molossers, descendants of the Molossus, a dog that lived around the time of 700 BC. Based on ancient carvings and paintings, it appears that Molossus, ..."
^ The Mini-Atlas of Dog Breeds by Andrew De Prisco, ISBN 0-86622-091-7, 1990, page 149,"... and Mastiffs were crossbred with the indigenous dogs, which were probably descendants of the ancient Molossus. The dogs were bred to fight to the death in the silent, stoic, ..."
^ The Mammals of the Southern African Sub-region by J. D. Skinner, ISBN 0-521-84418-5, 2006, page 277, "... XXII. F<u11ily MOLOSSIDAE Gervais, 1856 Free-tailed bats The name of the family is derived from the Epirotan Molossus, a dog used by Epirotan shepherds in ancient times. The head of a molossid is reminiscent of a ..."
^ A Complete History of Fighting Dogs by Mike Homan, ISBN 1-58245-128-1, 2000, Page 1,"... able dogs in battle previously known to the Romans were the Molossian dogs of Epirus, specifically trained for battle by the military. ..."
^ My Albanian studies. Molossian Dog. ^ The Mini-Atlas of Dog Breeds by Andrew De Prisco, ISBN 0-86622-091-7, 1990, page 136,"... Mastiff prototypes, such as the Molossus of Epirus and Babylonian Mastiff, were used as flock guards against wolves and other predators. ..."
^ New Saint Bernard by George Gwilliam, ISBN 1-58245-168-0, 2000, page 8,"... now but it was part of the accepted culture at that time. When the Romans conquered Britain, they brought giant Molossus with them. ..."
^ http://classics.mit.edu/Aristotle/history_anim.9.ix.html, The History of Animals, "Of the Molossian breed of dogs, such as are employed in the chase are pretty much the same as those elsewhere; but sheep-dogs of this breed are superior to the others in size, and in the courage with which they face the attacks of wild animals." ^ The Mammals of the Southern African Sub-region by J. D. Skinner, ISBN 0-521-84418-5, 2006, p. 277, "The name of the [free-tailed bats] family is derived from the Greek molossus, a kind of dog used by Greek shepherds in ancient times." This page was last edited on 9 April 2019, at 18:24 (UTC).